I love stories — particularly personal accounts that give me a keyhole-sized peek into locked and dusty inner rooms of the storyteller’s life. Each of us have stories like that, stories that we once told and retold so many times until there was no one new to tell them to. These are the stories that eventually end up locked away until someone comes along who prompts us to rummage through old memories until we find them and then tell them anew. I stopped in Falfurrias this afternoon on my way to visit my Dad in South Texas. This small town changed years ago when the highway department decided to reroute Highway 281 to the edge of town. When that happened many of the little businesses along the old highway dried up. The Dairy Queen, however, is still located along the old highway and doing well. I stopped there today and enjoyed a Hunger Buster meal with complimentary sundae, all for $5.00. While I was enjoying my sundae, I decided that I should get a haircut before continuing my journey south. So, I Googled local barber shops and found the only one in town less than a minute from the Dairy Queen. When I turned off the old highway onto Huisache Street I spied the little shop in the middle of a chalky caliche lot. The sign above the shop read Morales Barber Shop. And, Mr. Morales was standing at the door, wearing jeans and a red tee-shirt advertising the name of his shop. Morales greeted me in Spanish and asked me if the bike in the bed of my truck was for sale. “No,” I replied, “I’m from out-of-town and just stopping by for a haircut.” He invited me in to his small, single-chair shop — the panel-lined walls smattered with pics of local clients and friends on one side and a framed list of Vietnam Memorial names on the opposite wall. I was curious. As Morales clipped and tamed the few remaining hairs on my head, I asked him how long he had been at this location. “Forty years,” he replied. “I have only been three things,” he continued. “A student, a soldier, and a barber.” One question led to another and he began to tell me about the names on his wall, all friends in his unit who were killed in Vietnam in the late sixties. Friends who had visited the Vietnam Memorial in DC had brought him the pencil-rubbed sheets with the names of his friends. “I tried to visit the wall,” he said, “but could not do it.” He explained that it was too painful. I shared with him what I felt on my first visit to the memorial and what a solemn experience it was. He dropped his arms to his side and asked me questions. He then reached far back and dusted off old stories that made his voice tremble a bit and that gave me goose-bumps. This gray-haired barber became a master storyteller. I was enthralled. We talked for quite a while. “How much for the haircut, Mr. Morales?” He reached out and shook my hand as he said, “Nine dollars.” I handed him a twenty and told him to keep the change. “Are you sure,” he asked. “Yes,” I replied, “it’s always good to meet a veteran.” He invited me to stop by again the next time I am in the area. I plan to do just that, regardless of whether or not I need a haircut and because sometimes I just need to hear a good story. 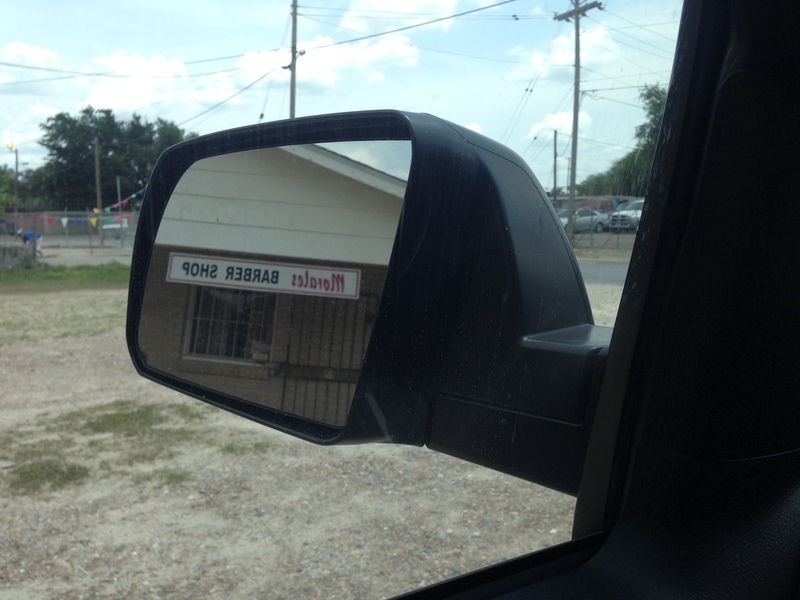 As I drove away and caught a glimpse of the barber shop in my mirror, I thought about one of my mother’s favorite quotes from “Crow and Weasel”, a fable by essayist, author, and short-story writer Barry Lopez. The quote: “If stories come to you, care for them. And learn to give them away where they are needed. Sometimes a person needs a story more than food to stay alive.” Thanks, Mr. Morales, for sharing your stories with me. Thanks, John. I appreciate your kind words. Beautiful entry today, Omar. And I love the quote from Barry Lopez. Thanks for giving this ‘story’ away. Thanks, Pam. Appreciate you and your kind words. You are the same way Omar. Your stories bless me every day as I read of your travels and adventures. Thanks for sharing your stories with all of us. Thanks, Gay. I really do enjoy sharing stories. Thanks for your faithful friendship and blog followship.